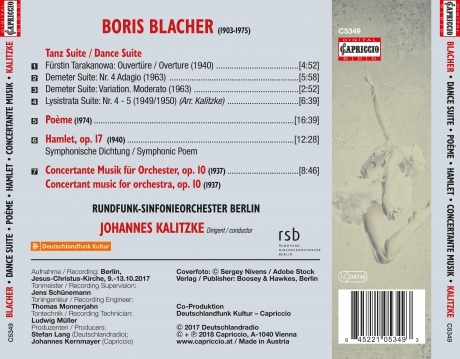 What Boris Blacher passed on to many of his students – like Gottfried von Einem, Aribert Reiman or Isang Yun - primarily also characterizes his own music: a pronounced gestic and dance-like energy, lyrical melodies, orchestral sparkle, but also very subtle and intimately instrumented moments. 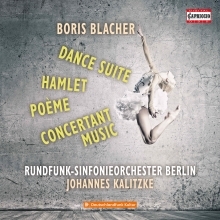 The Poemeis an excellent example of the fact that for Blacher, who wrote a large number of ‘genuine’ ballets, movement plays a central role even in works that are to be understood as absolute music. It sounds almost a little strange that such an individualist and musician open-minded to absolute innovation had no direct problems with the conditions imposed by Nazi cultural policy also on the whole field of music, but quite the opposite, was in a position at that time to compose some of his major works. . It was probably due to the disunity of the pundits in the Third Reich that Blacher was permitted to continue his very individual course, without being disciplined too severely.